SAN MARCOS — The CIA is the acronym for the U.S. Central Intelligence Agency. Believe it or not, it’s also the ethos for the California State-San Marcos men’s soccer team. Short for communication, intensity and attitude, Coach Ron Pulvers said in a pre-game interview that he attributes CIA to the team’s historic first ever ranking inside the National Collegiate Athletic Association Division-II top 25. Off to a 6-0 start, the team was one of just 16 teams to achieve such a feat to date when it got into the top 25 for the first time on Sept. 18 at the number 19 slot. The Cougars lost their first game of the season on Sept. 21 to the University of California-San Diego Tritons in an away match. Pulvers told The Coast News in a post-game interview that though they lost the game, he saw it as an opportunity for his team to grow and learn, while also giving a nod to the effective play of the UCSD squad. The Cougars came back from a 2-0 deficit in that game against the Tritons in the last 12 minutes of the 90-minute affair against the fellow top 25 opponent, scoring two goals to tie things up and send it into overtime. But just a few minutes into the sudden death overtime, the Tritons scored, ending the game once and for all. Beating back adversity and coming from behind in games has, to date in the season, been a staple of the CSU-San Marcos squad. But Pulvers said after the game against UCSD that he wants his team to practice getting off to better starts in games. 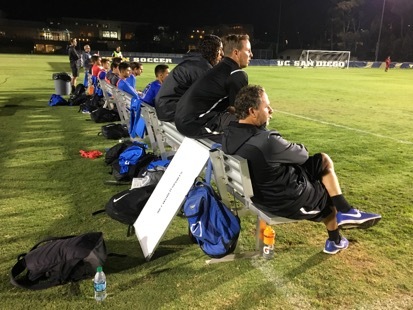 During a pre-game interview before the match against the Tritons, Pulvers also said that — though the team is proud of the historic premier ranking inside the top 25 — it is a long season and he has instructed his players to take things one day at a time. In fact, Pulvers said that he thinks that the top 25 ranking has put the Cougars on the map as a team that others now will put their best feet forward against. Put another way, the team has a target on its back, which serves as fuel to the fire for them. Likewise, junior goalkeeper Justin Tesar downplayed looking forward to any given game throughout the rest of the season — including the one which was then-forthcoming against UCSD — because the fight which goes into every game matters equally. These “non-negotiables,” Pulvers explained, are intangible things which need to happen to achieve success as a team. And coming full circle, those are what the CIA is for the team in a nutshell, a foundation upon which the team got into and hopes to stay in the top 25 rankings. The Cougars will next play a two game home stand in San Marcos at The Cage on Sept. 28 and September 30. They will play against Humboldt State and Sonoma State, respectively. After its loss to UCSD, the Cougars have slipped from 19 to 23 in the top 25 rankings.